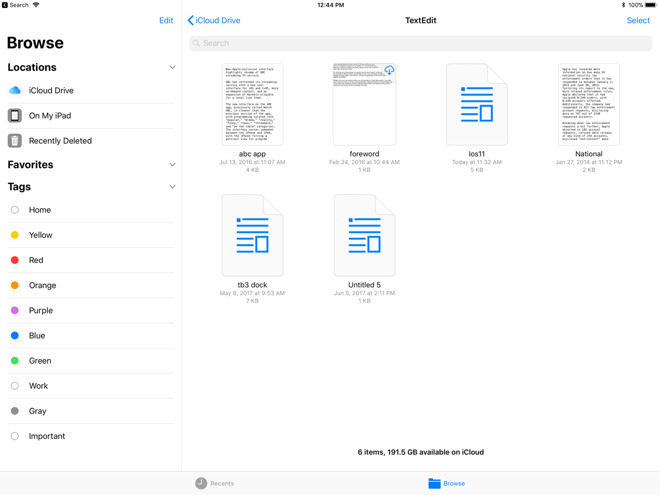 The app itself is relatively simple, giving a two panes for recent documents and all documents stored in the cloud. Both are exactly what they say they are, with the former giving a list of all of the user's recently opened documents from iCloud and the latter presenting folders of various application's associated files. The iOS 11 update's new drag and drop feature is critical to Files, and allows users to move files from folder to folder, or service to service with ease. Users can toggle on or off different apps and services that have Files compatibility, such as Amazon Drive, macOS X Server, Dropbox, or the like. However, there are some limitations for users accustomed to the Finder in macOS. Files has no integration with other iOS apps by default, and has no ability to talk to macOS on a local network without macOS Server. We like GoodReader for a PDF consuming tool here at AppleInsider. At present, the GoodReader file repository is stored in the app, and not visible by the Files app at present. This may change in an update to the venerable utility —but that's up to the developer. Other than setting up a macOS Server install, there is no way to move a file from macOS to iOS other than using iCloud, Amazon Drive, DropBox or some other service across the internet, rather than keeping the file on the local area network. Even with the limitations that will only be notable for a small set of users, the Files app is a good move towards fulfilling user demands of more discrete file system access. For the first time, users can move files between apps in a graphical user interface, and not rely on an inconsistent "share" button to move files between apps.